TENSION - 9tr and 5 rows of tr's measure approx 2" x 2"
Motif (make 4) - Made in rounds without turning to last row. With contrast colour 1, make 6ch, ss to first ch to make a ring, working into ring make 3ch, work (2tr, 2ch) into ring, followed by (3tr, 2ch) three times into ring, ss to top of 3ch on beginning of row. Fasten off. of 3ch on beginning of row. Fasten off. ss to top of 3ch on beginning of row. Fasten off. With WS facing ss motifs together lengthways. corner, rpt from ** to ** once, ss to top of 3ch on beginning of row. of the corners, ss to top of 3ch on beginning of row. more in main colour. Fasten off. Next Row - Join in contrast colour 1, 1ch, 1dc into base of 1ch, 1dc into each tr around all four sides to end, working 3dc into each corner, ss to first dc on beginning of row. Turn. ss to top of last dc worked, 1dc into each of next 4tr, * rpt from * to * around four sides including corners, ss to first dc on beginning of row. Fasten off. 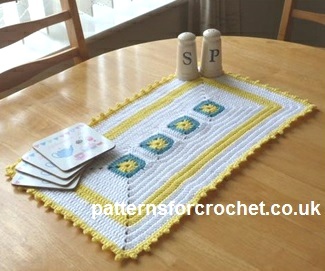 Hope you enjoy this free crochet pattern for a decorative centre piece.